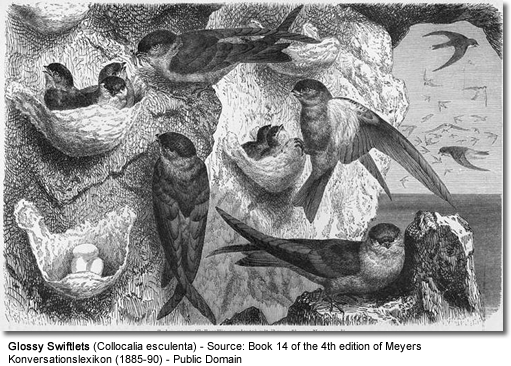 The Glossy Swiftlet (Collocalia esculenta) is a species of swift in the Apodidae family. It is found in Australia, Brunei, Christmas Island, India, Indonesia, Malaysia, Myanmar, New Caledonia, Papua New Guinea, the Philippines, Singapore, Solomon Islands, Thailand, and Vanuatu. It is shiny black-blue above, including its rump; sometimes looks black and hooded. Chest black; belly to flanks white with fine black speckles at margins. 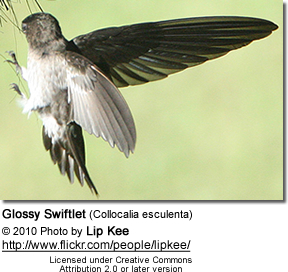 Wing tips are rounded; underwing is black. Tail rounded with shallow notch and tiny white panels. 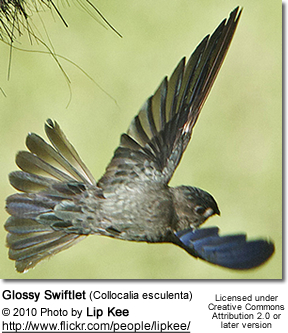 It is similar to the White-rumped Swiftlet, that its upper- and underparts must be seen to identify it. Its voice is a soft twittering. BirdLife International 2009 in IUCN 2010. IUCN Red List of Threatened Species. Version 2010.1. Simpson, Ken and Day, Nicholas (1999). Birds of Australia, pg. 156. Princeton University Press, Princeton, NJ. ISBN 0691146926.